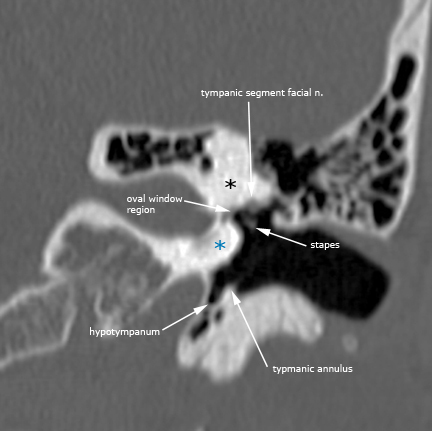 There are many inflammatory conditions that can affect the temporal bone. 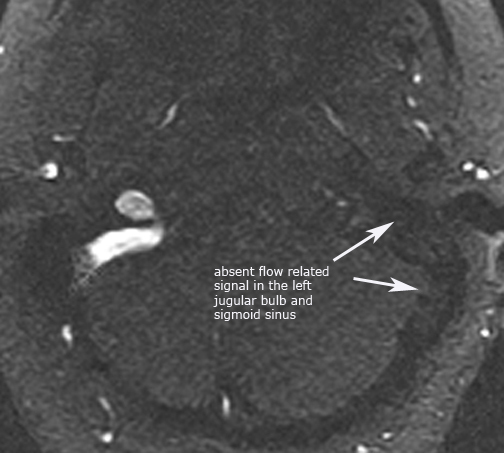 Therefore, it is common practice to evaluate the infection or inflammatory processes based on the anatomic region affected. 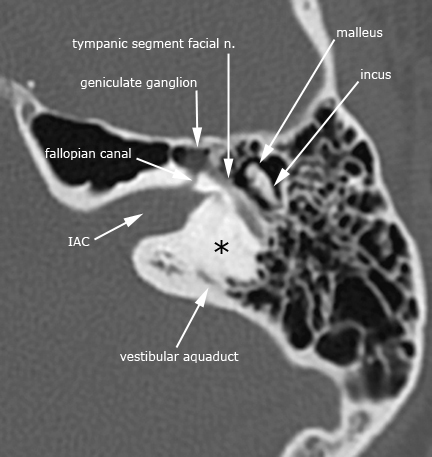 The 4 anatomic regions are the external ear, middle ear and mastoid, inner ear and the petrous apex. 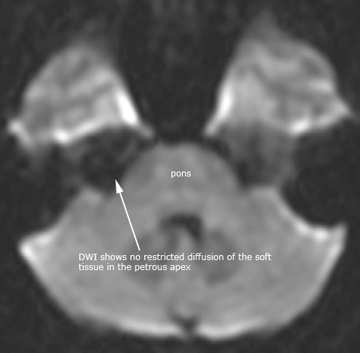 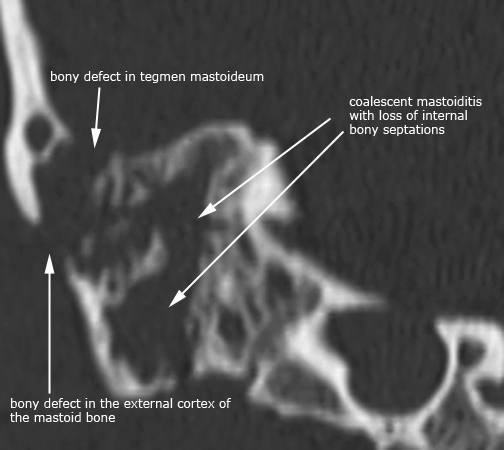 The most common inflammatory condition to affect the temporal bone is acute otitis media (AOM). 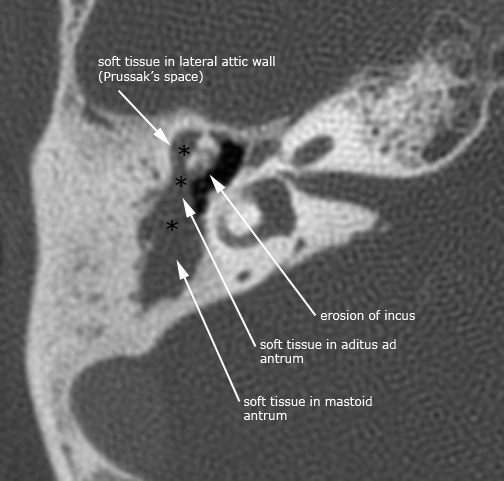 Acute otitis media is the second most common disease of childhood after upper respiratory infection. 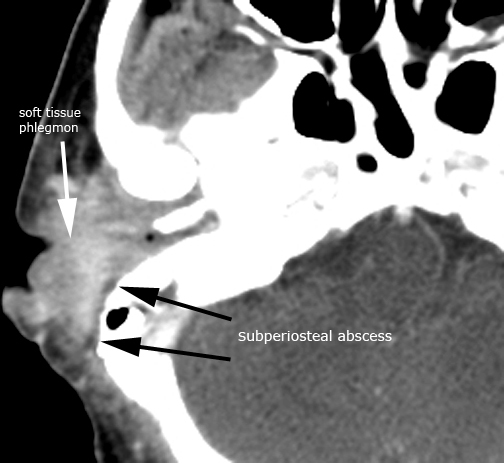 AOM usually occurs as the sequelae of a viral upper respiratory infection with disruption of the mucosal barrier allowing bacteria from the nose and nasopharynx to spread to the middle ear. 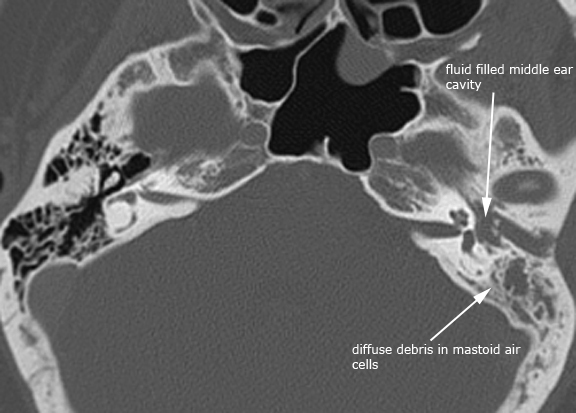 Chronic otomastoiditis (COM) typically occurs as a result of long standing eustachian tube dysfunction. 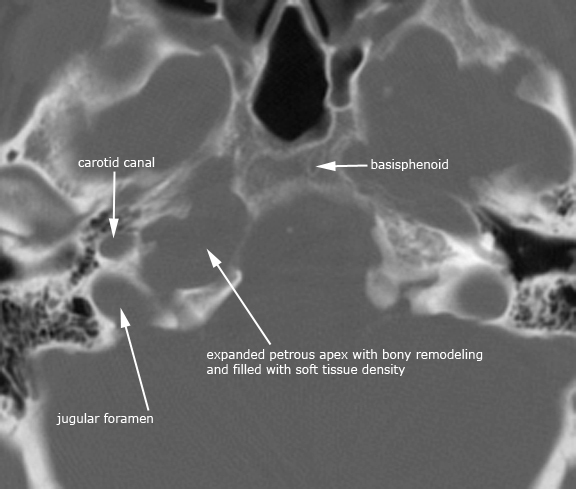 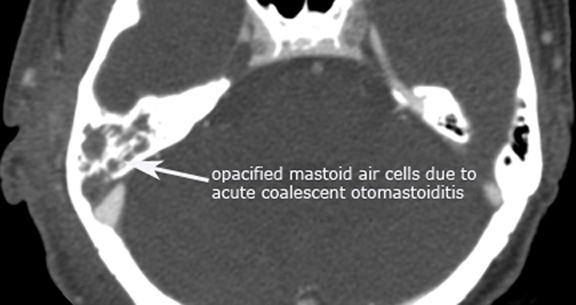 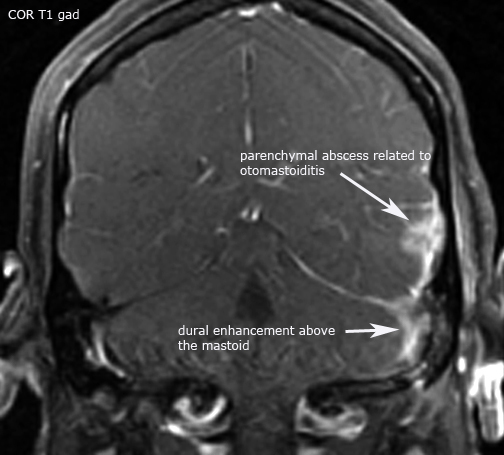 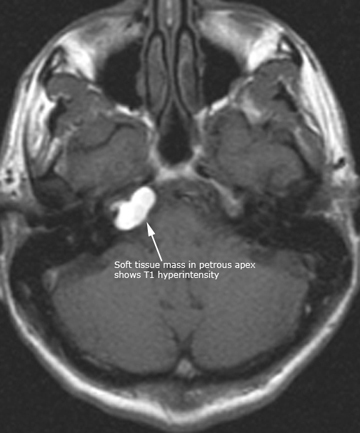 Important complications to consider when evaluating acute otomastoiditis of the temporal bone include coalescent mastoiditis, Bezold's abscess, subperiosteal abscess, dural sinus thrombosis, intracranial abscess, empyema, meningitis, facial nerve involvement, labyrinthitis and petrous apicitis. 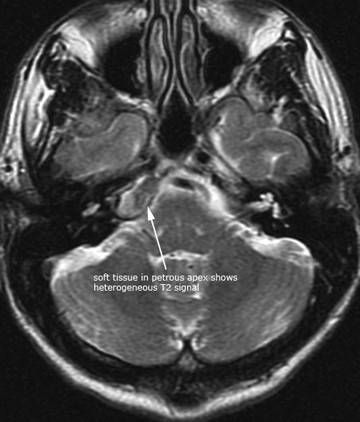 These same complications can occasionally occur superimposed on chronic otomastoiditis. 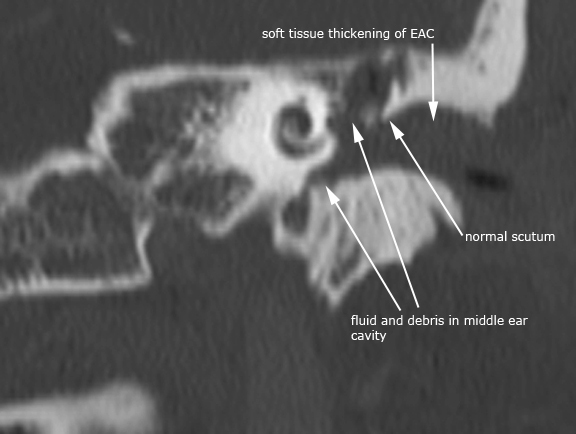 Both AOM and COM can result in the development of aquired cholesteatomas in the middle ear. 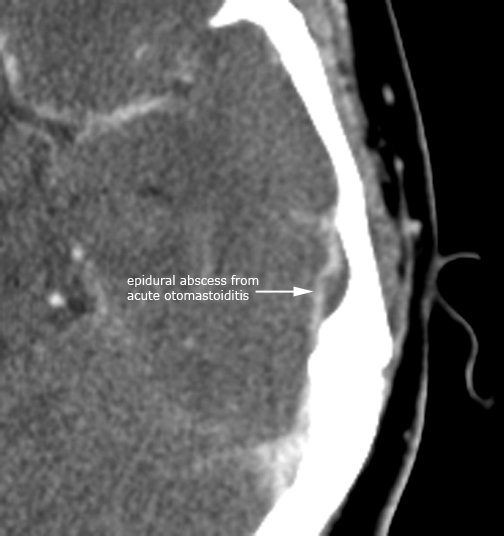 A cholesteatoma is ectopic skin growing in the wrong place and is composed of a sac lined with stratified squamous epithelium filled with exfoliated keratin debris. 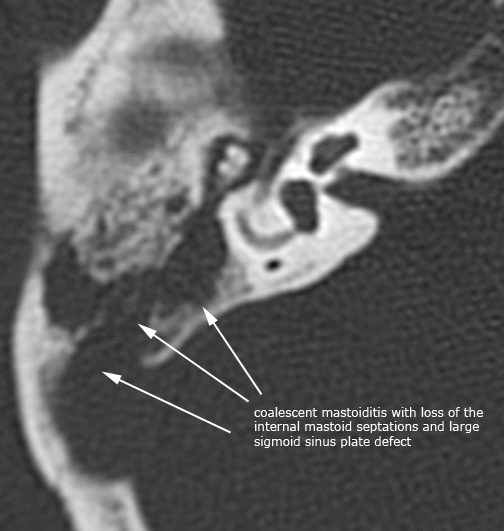 Most cholesteatomas of the middle ear are acquired (98%) the rest being made up of congenital cholesteatomas. 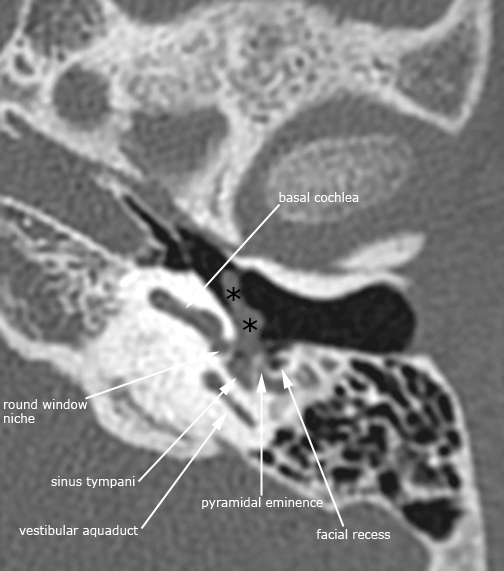 Acquired cholesteatomas typically arise in the pars flaccida, and less commonly the pars tensa region of the tympanic membrane. 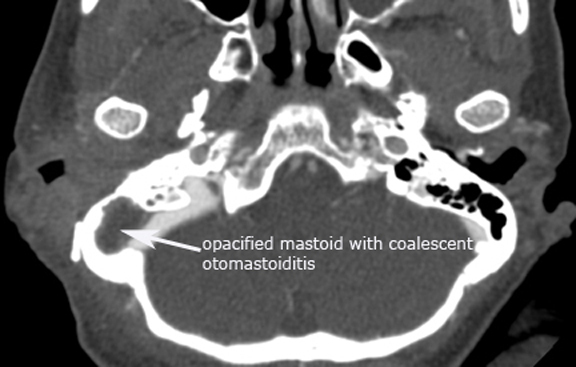 The following cases are just a few examples illustrating otomastoiditis and some of the common sequelae listed above. 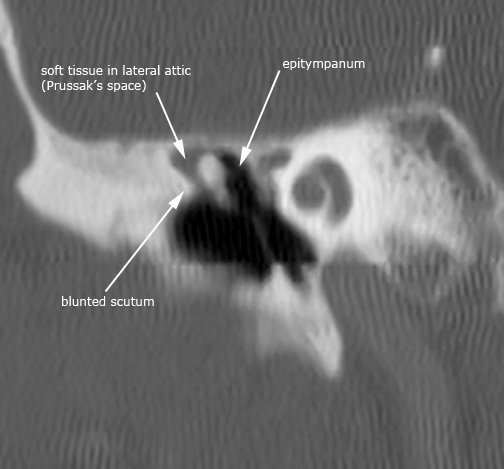 There is also a case of labyrinthitis ossificans which is the pathologic ossification of the bony labyrinth and cochlea as the end result typically following an inflammatory result. 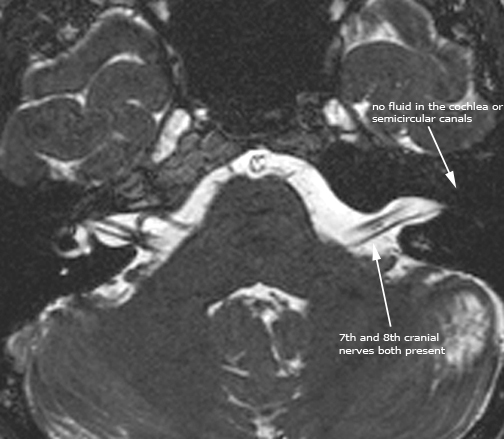 The most common cause of labyrinthitis ossificans is due to suppurative bacterial labyrinthitis usually in childhood. 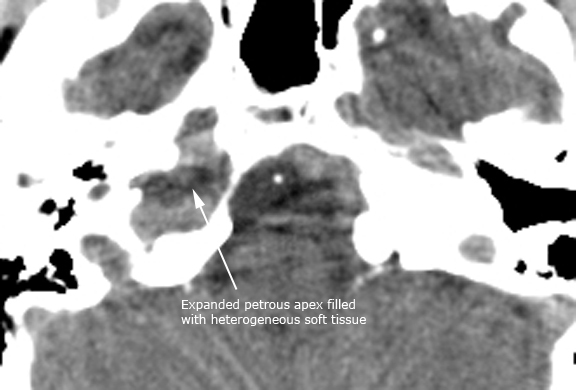 Lastly, there is a case of a petrous apex cholesterol granuloma. 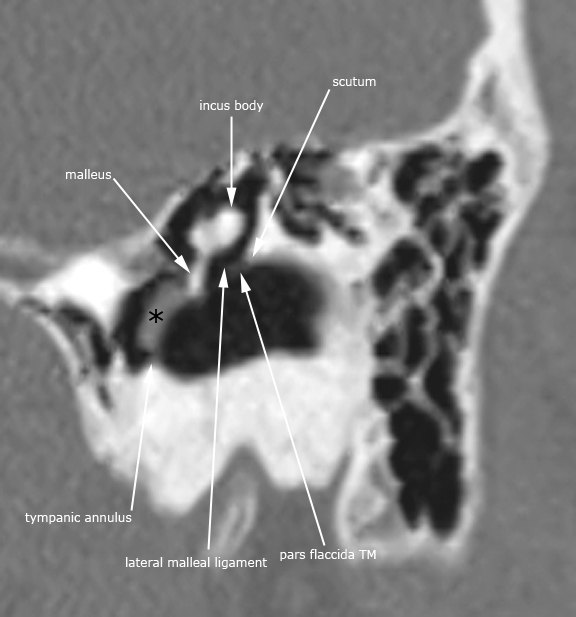 Pneumatization of the petrous apex contains mucosa-lined air cells which can develop similar inflammatory conditions as a result of middle ear infections. 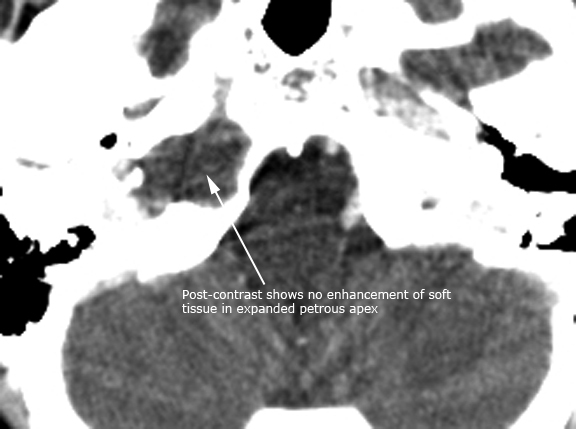 The cholesterol granuloma results as a foreign body giant cell reaction to the deposition of cholesterol crystals in the air cells with fibrosis and vascular proliferation. 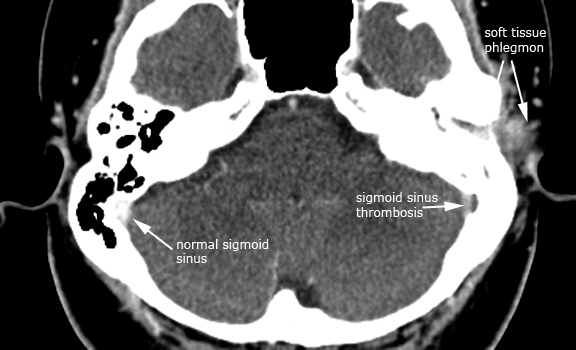 The characteristic CT appearance of a cholesterol granuloma is a bony expansile lesion with typically smooth bony margins, and on MR imaging shows bright signal on T1 and frequently bright on T2 due to the cholesterol crystals and methemoglobin from repeated hemorrhages.